For the second day in a row we drove up Silver Canyon Rd in the White Mtns. It can be a daunting 4WD route with the wrong vehicle, but Tom's Jeep made it feel almost like the morning commute to work. This time around we were heading to Cottonwood Creek on the east side of the crest, an area none of us had visited before. There were a handful of 10Kft+ summits around Cottonwood Basin that had caught my attention and it seemed we could visit them all in a large loop covering about 13mi. Laura joined us for the drive but stayed at McCloud Camp where we parked, needing to spend the day studying for her upcoming work-related class she was enrolled in. The outing turned out to be the finest of more than a dozen days I've spent in the White Mtns, perhaps the most scenic part of the range. There were old roads to discover, fine vistas, and some great scrambling that I hadn't thought existed in the Whites. The only downside was the great amount of driving it entailed to reach our starting point, more than two hours worth - and that was taking the "shortcut" up Silver Canyon. On the plus side, we came across a large herd of bighorn ewes and lambs low in the canyon, prompting us to pause for an impromptu photo shoot session. After reaching the crest and White Mtn Rd, we drove down Crooked Creek past the research station before finding the junction for the road going north up and then down into the Cottonwood Creek drainage. We spent some time clipping the encroaching brush, both from inside and outside the Jeep, the latter being far more efficient. After reaching McCloud Camp, we spent more time exploring the area that featured a couple of log cabins, one from the late 1800s and another from the 1930s. It was close to 9a before we finally started off on our hike. To begin, we followed the continuing road east downstream, crossing the creek several times with the road. We found three other parties camped at various locations within the remaining half mile of road before it turns to a trail at the Wilderness boundary. The nice use trail continues along the creek for another five minutes to the confluence with the North Fork of Cottonwood Creek. Karl took up a conversation with another guy who happened to be walking along the creek around the same time who told Karl he'd been coming here for almost 40yrs now. One of the interesting tidbits he shared was that the rare paiute cutthroat trout could be found in the North Fork where fishing is forbidden. Sure enough, when we started heading up the north fork we found signs to this effect. There was no trail up this way as we might have hoped, but the knee-high grass was not hard to navigate through and after 1/3mi it was time to start heading up out of the creek drainages anyway. This initial slope climbed steeply for 900ft before the slope relented as we gained Tres Plumas Flat around the 10,000-foot level. From here we had a bird's-eye view looking down on the Cottonwood drainage and across the east side of the White Mtns. 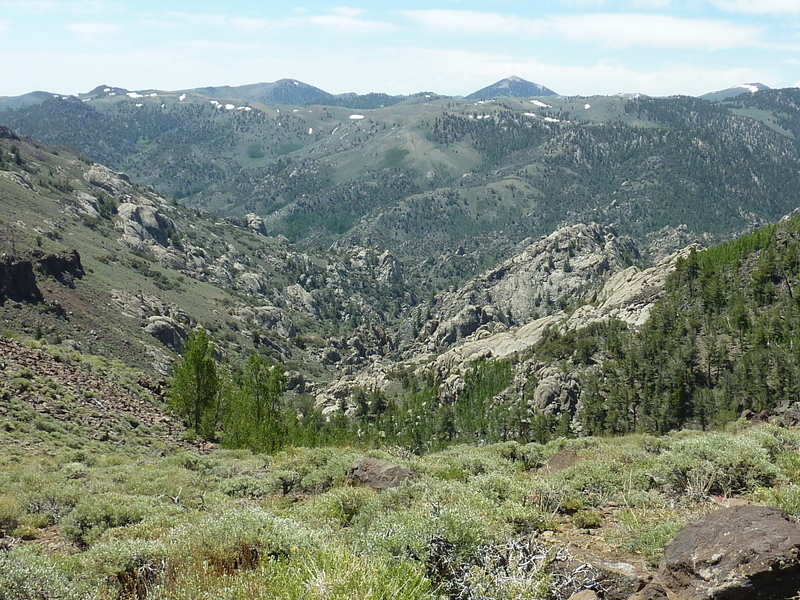 The last mile to Tres Plumas Peak was an easy hike across the high plateau with only modest, low brush to contend with. We reached the first just after 10:30a. Along with a benchmark, the summit held a register left by a MacLeod DPS party in 1985. The register was surprisingly busy for such a remote peak. Many of these entries were from before 2009 when the White Mtns Wilderness was created and blocked the easier access to Tres Plumas Flat that existed before then. We could see one of the old roads crossing the plateau below to the northwest, and would use it for the next leg of our adventure. We dropped northwest off the summit, aiming for a small lake where we could pick up the old road. It was difficult to find around the somewhat marshy lake where the flora has done a better job of reclaiming the roadbed. As we moved north to drier ground, the road became more distinct and we followed it for more than a mile and a half to the northwest, crossing the plateau before slowly dropping down to the North Fork of Cottonwood Creek. The road would disappear again as we reached Tres Plumas Meadow but it mattered little since this was where we turned to head southwest up to Peak 10,660ft, the easiest of the four summits we visited. It lies in the center of the Cottonwood Basin, providing a great vantage to study the complicated topology of the area to the west and south that we would travel through in the last leg of our hike. Our third stop was Peak 11,420ft, the highest and most remote summit some 2mi northwest of Peak 10,660ft. Our route started by heading north across Tres Plumas Meadow. There are several old fences encountered at the north end of the meadow, remnants from the grazing that once took place in these high, scrubby meadows. Another steep section occupied us for a while as we climbed about 600ft to a ridgeline, turning northwest to follow it towards the highpoint and our summit. I reached the highpoint about five minutes before the others, giving me time to enjoy the views to Fishlake Valley and beyond to the northeast and White Mtn Peak to the northwest. I also studied the views looking south to plan a route back towards Cottonwood Creek and our last summit. One can see an old road network to the west of the main creek drainage, some of which would prove useful. When the others joined me and had time to catch their breath, a short discussion took place to decide on our strategy. Our biggest uncertainty centered around the confluence of Cottonwood Creek and Granite Meadow that looked on paper to make the easiest return towards the south. From Peak 10,660ft we could see that Granite Meadow was easy walking and even had an old road we could see running along its length. The part of Cottonwood Creek just north of this, in contrast, appeared to devolve into a rough, aspen-laden bushwhack. Karl had offered that we might skirt all of this by traveling west through drier, less brushy terrain. Now that we could see the road network in this area from Peak 11,420ft, it seemed the better bet and that was what we ultimately went with. We dropped 900ft to the south off Peak 11,420ft into the upper Cottonwood Creek drainage, following this for half a mile downstream until we found our way to the road network in the basin above and west of the creek. With a combination of road and cross-country, we continued south for several miles to reach Granite Meadow. The last downhill section to the meadow went through an aspen thicket that proved easier than it had first appeared. Once in Granite Meadow we picked up an informal trail and followed it south to the west side of Peak 10,260ft, our last summit for the day. The peak sits in the center of the most interesting part of Cottonwood Basin, a convoluted collection of granite rock that has some rather fun scrambling, unusual for the White Mtns. The route I picked out wasn't optimal but it was quite fun, taking us about 45min to reach the base of the summit blocks. Approaching it from the west, Tom followed a cool rock edge up to the slightly lower west summit block while Karl took another route to the right that landed 20ft below the summit blocks. I followed something in-between, ending up under the summit blocks with Karl. Tom was somewhat dismayed to find the western block to be lower. The eastern block had a handline dropping down from the top on the west side to the notch between the two blocks. Tom was not excited about using the handline, especially with gusty winds that would make for a nervy ascent. It took some class 4 scrambling to reach Tom at the notch from below, where I could then study the summit block more carefully. The granite is grainy with excellent traction and it didn't seem too bad. I went up, a little nervously, took a few pictures and tried to convince Tom to join me. Nothing doing. He wouldn't exactly be content to stay below, but since this wasn't a high-priority summit for him, he would let it go. Karl likewise showed no desire to give it a try, so I descended back down after less than a minute.